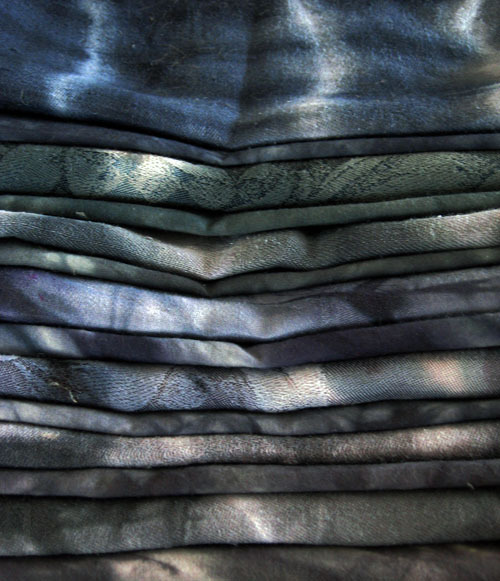 I finished up the last few color samples over the weekend, and have selected the 8-10 colors I'll use in my upcoming shibori class (March 26-27 in Eureka -- email me for more info if interested in participating). Probably 80% of these samples were done with mixed colors, created by me using primaries and/or already-mixed colors. 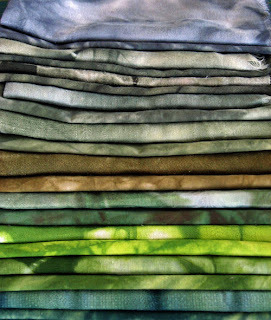 And all dyes, except for one black sample, were from Dharma Trading and Pro Chemical. The other 20% were straight pre-mixed colors. Most of you likely know this but for the few who don't, the "primaries" in the Procion line, no matter who you get them from, those with an MX designation in their formula number, are the same dyes from the same pigments -- and, I believe, originally formulated by Ciba a number of years ago. The suppliers -- Dharma, Prochem, Jacquard -- then mix these primaries in various ways to produce their respective lines of mixed-color dyes. Sometimes they're virtually the same between suppliers, but with different numbers and different names...sometimes the same number and/or name will be a completely different formula. So unless you go with only primaries, you'll end up doing a lot of experimenting...which is what I've done. When I used acid dyes, I mixed from primaries exclusively. With fiber reactives, I'm using some primaries and some mixed colors, and combining them. I don't think it matters what you do, as long as you're able to create a color palette that you like. That's the bottom line. Being a dyer has really brought out the "closet chemist" in me (better living through chemistry). I've been enjoying the more technical details of dye experimentation. I realize what I do is likely over the top for most folks, but so be it...it doesn't seem as though I've really done it if I'm not thorough! On another topic completely, I'm reading Marlena de Blasi's The Lady in the Palazzo, which is about her settling in Orvieto, Umbria with her Venetian husband Fernando. Another great read. Especially now that I no longer plan to attempt to actually move to Italy, I can read about others' trials and tribulations emigrating to another country without having to entertain the idea of ever doing it myself in the future. I'll definitely be traveling to Italy sometime down the road, but Humboldt County is home. I'm on the hunt for old linens. They're hard to come by in my neck of the woods. The few thrift stores we have here almost never get nice old linens -- I fantasize that one or two local antique dealers pick them off before they hit the shelves in the thrift shops, then sell them in their own shops with inflated prices. 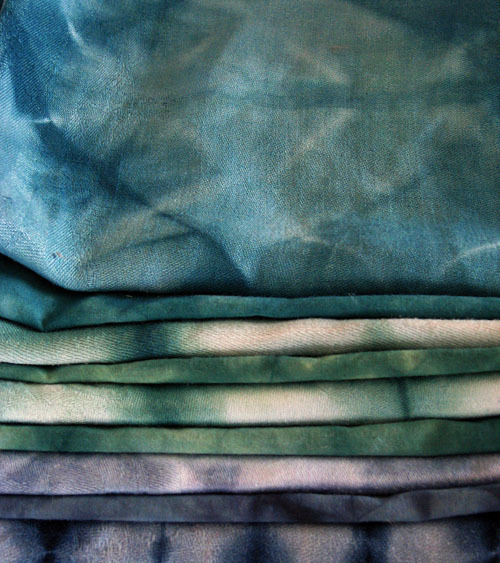 I won't pay good money to tear up linens to use for shibori, so I'm perpetually on the lookout for those that slip through the cracks. If any of you reading this want to contribute any old linens to the cause, please email me! 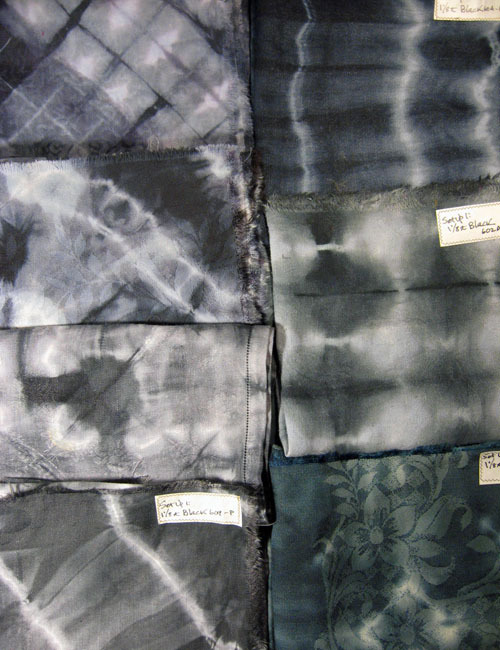 I'll be teaching an Introduction to Shibori Workshop, March 26-27 at Origin Design Lab in Old Town Eureka. 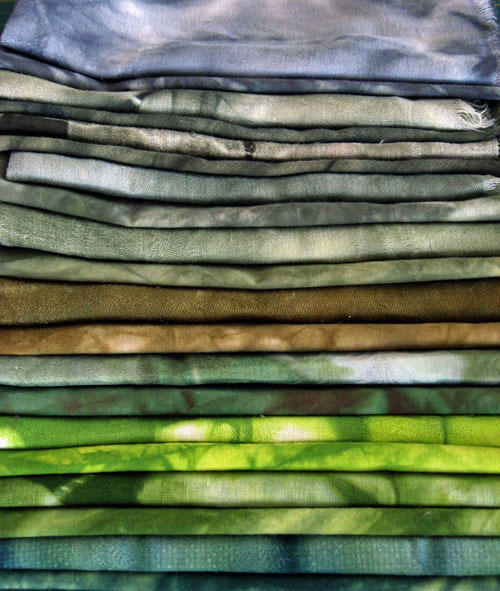 You'll learn how to use fiber reactive dyes via a (relatively) brief immersion process -- as well as how to manipulate fabric by binding, folding, stitching, clamping and pole wrapping, to create your own beautiful, unique resist-patterned cloth. For further information and to register online, see my Workshops Page. You can also register directly with Origin. For more images of my work with shibori, click here. I just completed the last of the 4-piece Fortuna series. This one is Behind a Cloud. Its mate is Storm Warning -- see that here. It's always satisfying to be finished with a project or a series...now my imagination is free to conjure what's next. Have a good week, I'll be back in a few days. 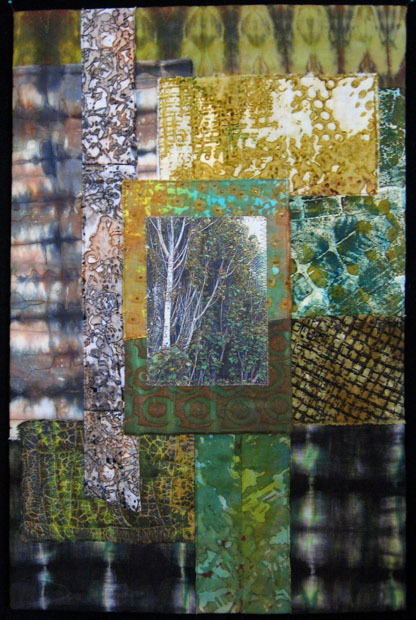 This is Cottonwood Summer, 26 x 17 inches, completed today. Both this piece and its mate, Late Spring, look much better in the flesh than they do photographed. But so be it. After a lovely birthday dinner last night with a girlfriend, I watched The Girl Who Kicked The Hornet's Nest, which I think I liked the best of the Stieg Larsson trilogy -- probably because of the sense of closure it gave. I also have a new favorite actor, Noomi Rapace -- if you haven't Googled her to see who she might be in real life, check out these images. She's quite a lovely woman. Tomorrow I'm planning to add facings to three quilts completed over the last six months, to give them more ballast so they hang better. 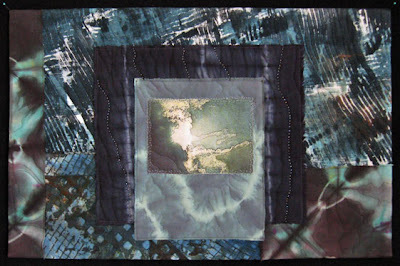 These are pieces where I preserved the raw edge of the fabric on the edges of the quilt, by turning the backing toward the front and over the batting, and then stitching or fusing the edge of the quilt top down onto that. 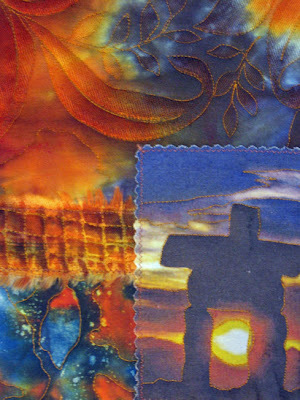 What I plan to do tomorrow is hand stitch finished strips about 2" wide right near the edges of the quilt on the back. I'll have to take the sleeves off first but that won't be a problem. 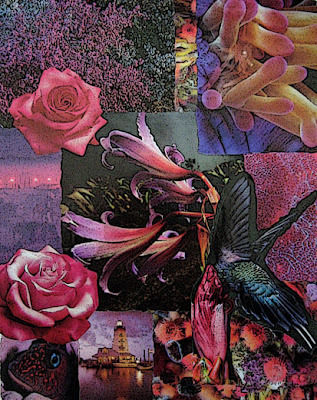 I created this collage yesterday, in honor of my birthday today. I never had a Sweet 16 when I was a teenager, so I'm having myself a virtual Sweet 62 right here online -- if you're reading this post, consider yourself part of the festivities! and hopefully about the making of art, as well. Or the making of MY art, anyway, which I'm not sure can be categorized as any one thing in particular. Which is cool -- no part of me needs to be categorized. 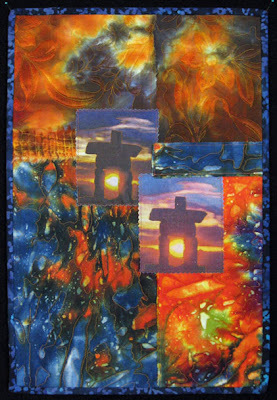 I am who and what I am, I make the art I make, all of it my individual expression of the Spirit within each of us. I have the day off work today, giving me a 5-day weekend. As always, I have big creative plans for these days. I like to have more on my to-do list than I'm usually able to complete, because it keeps me moving forward. 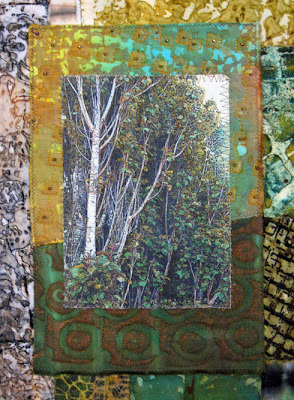 I'm hoping to finish the last two Fortuna quilts -- one sky, one trees -- and then move on to blocking out the next series. Those will be wholecloth, or nearly so, the fabric itself being front and center. An astrological note about today, February 18. This day is the cusp between Aquarius and Pisces. In newspaper-type horoscopes, Aquarius often goes through February 19. But the actual cusp is the 18th. As with any other cuspal day, whether you are one sign or the other depends on the year and the time of day you were born and where you were born. Until I was in my 30s, I thought I was an Aquarius, because all the popular literature said I was, being born on February 18th. But I never resonated with being an Aquarius. Then I learned that I am a Pisces, and largely so because I was born at 5:35 pm on February 18 in 1949, in Los Angeles. I'm actually just over the line, by five minutes of one degree. But I'm a Pisces just the same, which is what I've always felt I was. I've met and known a lot of people over the years who were also born on February 18 -- some Pisceans, some Aquarians. Interesting, isn't it! 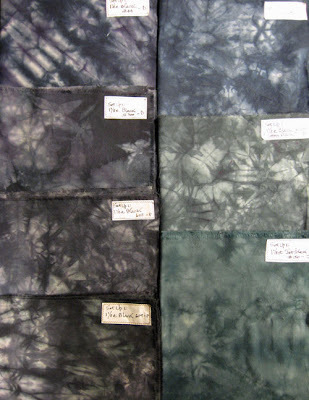 One of my dyeing projects over the past few weeks was to preview black dyes from a variety of sources. I did something similar a couple years ago, using three blacks from Dharma Trading...but finally got around to fleshing this project out farther. Both photos show the same dyes in the same positions. In the first photo are fat quarters of muslin. The second photo shows various sized pieces -- around a fat quarter or so -- of sections of old table linens. With all the sampling I've been doing, and this applies to every color or combo I've used, nothing changed from one batch to the other except the dye color(s). I used essentially the same amount of dye (between 1 and 1.5 tsp for the entire batch in 4 cups water -- slight quantity variations where I used two or three colors together), the same amount of water, same water temperature, same amount of salt and soda ash, same processing time. All these blacks were done with 1 1/8 tsp dye powder in each batch. I'll say more about this later. I've arranged the samples with the most purple black at the top left, down to the most true black IMO on the bottom left, then blue down to teal-tinged blacks on the right. The top left sample is Dharma's Black 44 -- quite purple actually. Could stand in for a combo of indigo and violet. Second sample on left is Dharma's Black 300 -- also purplish but not as intense a purple as the Black 44. Third on left is ProChem's Black 608, essentially the same as Dharma's Black 300. Maybe a tad bit less purple. They're close enough where I could see combining them into one container and shaking thoroughly! Bottom left sample is ProChem's Black 609 which, for my money, is the truest black in the bunch. The areas that want to go toward purple as in the above samples, here are closer to a charcoal gray. On the top right we have ProChem's Black 604 -- quite indigo, actually. You could mix this with a little navy and virtually replicate indigo. The middle right sample is ProChem's Black 602A "Cotton Black" which I don't think is very black at all, not on cotton and linen. It's rather teal and slightly green. Reminds me of Dharma's Black 39 -- which I don't use anymore -- which is quite green. On the bottom right is Jacquard's Jet Black 150 which is really a beautiful deep, dark teal. 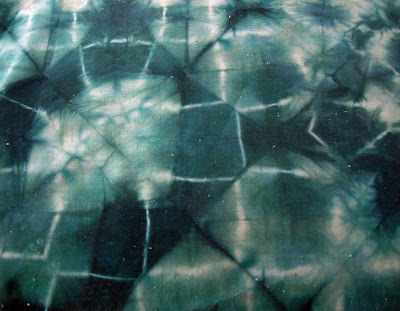 I originally learned to do shibori in a 5-gallon bucket with 2 gallons of water, 1 cup salt, 3-4 T of dye powder (predissolved, of course), and 4 T of soda ash. That size batch can accommodate up to 15 or even 20 pieces of fabric bound, stitched, clamped and/or folded, including several pieces on poles that can nest inside each other. For my sampling, I broke all those quantities down by eight, so that I could do each batch in 4 cups of water in a gallon jar, which accommodated 2 or 3 pieces of fabric, about 3/4 yard in total. The liquid wasn't deep enough for me to do any work with poles, but by doubling this small batch in the same gallon jar, one could manage a pole or two in addition to the other packets of fabric. Mix 1 1/8 tsp of dye powder in about 3 oz of hot tap water, to dissolve. Stir well, let it sit, come back and stir again. You want to get all the dye particles in solution. Put 2 Tbsp of salt in a gallon jar. Add four cups hot tap water and stir to dissolve the salt. Pour about a cup of salt water back into the measuring cup, then add the fully dissolved dye to the jar. Add the remaining salt water back into the measuring cup that held the dye, to get all the dye particles that are left in that cup. Then pour this into the jar. Stir. Add your 2 or 3 scrunched/bound/stitched/folded or clamped fabrics and make sure the liquid covers all. You'll likely have to hold the fabric under the liquid with the stir spoon for a minute or two. Time this operation for 15 minutes. While you're waiting for the initial 15 minutes to pass, mix up 1 1/2 tsp soda ash in a bit of hot tap water. You need really hot water to dissolve soda ash, but it doesn't have to be boiling. Mix it up and have it ready to add to the dye after the first 15 minutes. 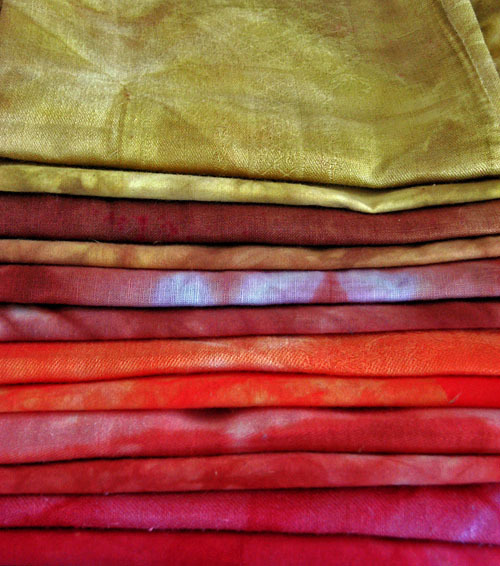 After 15 minutes, add soda ash and with your gloved hand in the liquid, mix up the dye liquid, squeeze the fabrics, agitate for 30 seconds or so. Time for another 15 minutes. With gloved hand, agitate inside the jar. Do this timing and agitating 3 more times, for a total of 1 hour of dye time following adding the soda ash. After an hour is up, fill your sink or a basin with cold water, take the fabric pieces out of the jar and put in the cold water to begin rinsing. 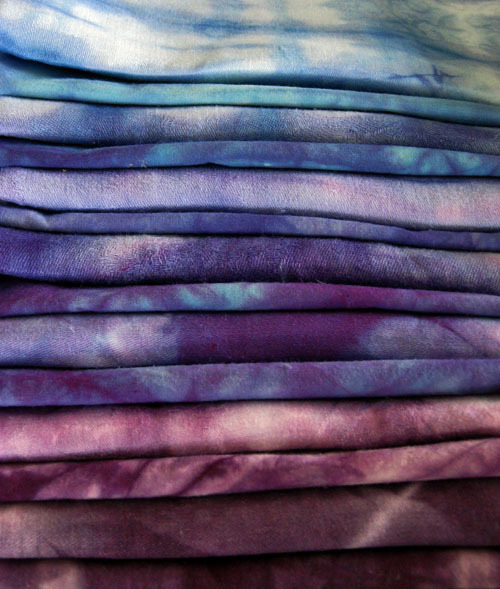 Dump out the used dye. 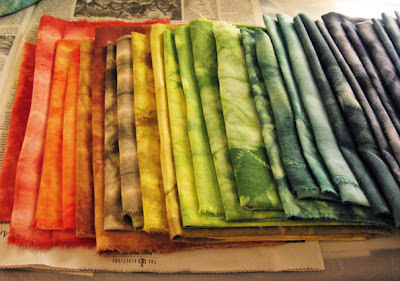 Do two or three rinses in cold water, unwrap the fabric at some point, get as much of the residual dye out of the fabric with cold water as you can. At the final rinse, squeeze out the fabric, and then wash in the machine with hot water and Synthrapol. Synthrapol is a product that keeps any remaining dye in solution, meaning the dye won't become unlodged in the wash and reattach itself to another piece of fabric, or white areas, or whatever. 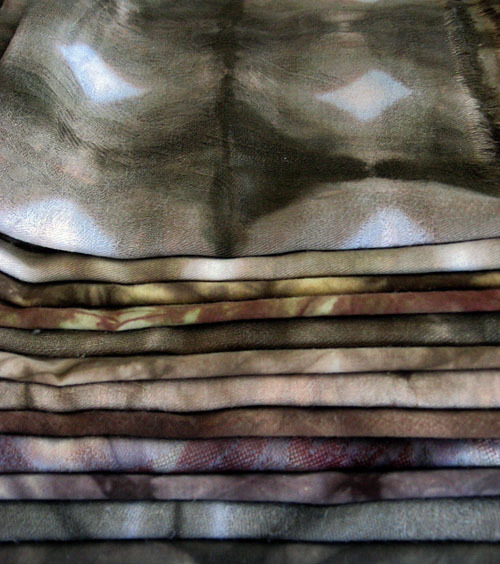 If you use Synthrapol, you can finish off many colors of fabric at once with no danger of dyeback. 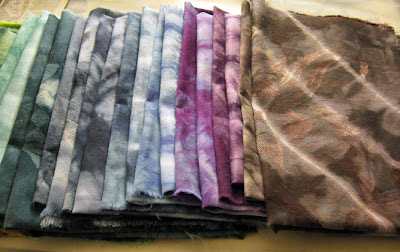 Or, you can hang the fabric in your shower to dry, do several shibori batches, and wash it all together at the very end -- this is what I do. Happy Valentine's Day, everyone! Sending you wishes of love, happiness, beauty, coziness -- and chocolate! After a lovely long break in typical winter weather, it is raining again here on the North Coast, and likely will be all week. 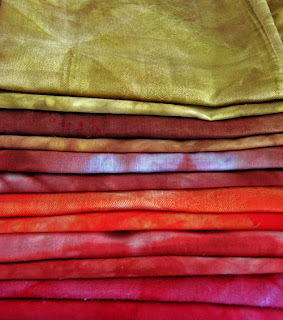 I spent the entire weekend dyeing more color samples and I'm planning to take things easier today. If you're a knitter, spinner or dyer, please check here to see what's still left in the Fiber & Yarn Supplies section of my Etsy Shop -- I'd really love to sell off the rest of these items and be done with it. I can give an additional 10% off any of the fiber supplies listed. I'll be back tomorrow with a dyeing update post. Have a beautiful Valentine's Day, wherever you are and whatever you do! 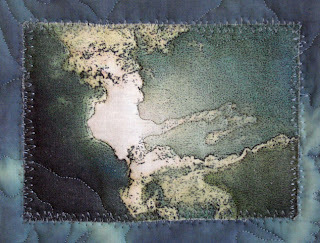 Here's the quilt I made this weekend for my Fortuna Fiber Artists' monthly challenge. Since November the group has been working with different design elements and different color harmonies each month. The challenge for February is to make a quilt using a split complimentary color scheme (I've used blue, red-orange and yellow-orange), and the design elements texture and balance. The group had an "Ugly Fabric" white elephant exchange in December -- so an additional challenge for February is to use some of that "ugly" fabric we each went home with. Both sections of fabric on the bottom of my quilt are part of the "ugly" fabric I had to work with. 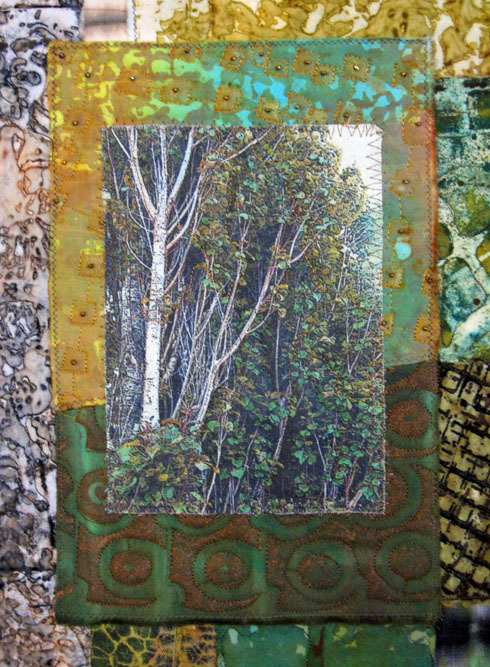 To see January's quilts by group members, visit April Sproule's blog here. This is what I've been up to for the last week, and there's more to come. Shibori samples! 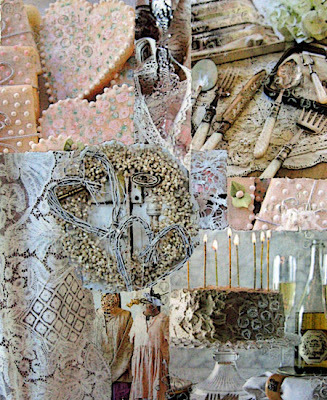 Every other piece of fabric in these photos is a fat quarter of muslin, and the other pieces are all old linens from various sources. I don't have plans for these yet, other than as samples, but I'm sure they'll make their way into my art quilts in the coming years. The linens are particularly lovely. 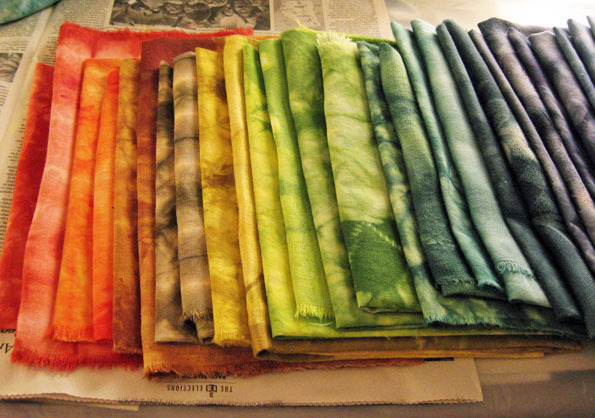 As I've been working, I've been thinking about the concept of dyeing fabric for specific uses -- like, needing a particular color for a special quilt. And I realized, again, that I rarely, if ever, work that way. I create the fabric first -- because I love surface design -- and then I design quilts based on the particular fabrics I have available. I'm starting preparations for a local show I'll be hanging at the end of March. Two big(ish) quilts to make yet, two more pieces to mount on stretched canvas, 10 framed pieces to varnish, hanging wire and/or slats to be taken care of. My local art quilt group meets again on February 14 and I've yet to do our challenge quilt for the month...although it is designed and will get done this weekend. I've had no inspiration yet for Fiberactions' next challenge, impression, due March 15. And then there was the bamboo earlier this week, what a job that was. It's clumping bamboo, there were no runners to deal with, but the roots were hugely knotted together and the root balls needed to be cut apart with an axe! A neighbor saw me struggling with my garden spade, hatchet, and two big sharp kitchen knives, came over with his axe, and in five minutes the job was done. Once everything has overcome transplant shock and gone back into growth mode, I'll take photos of the exterior of Rose Cottage. It certainly looks a far sight better than it did! Check out the TAFA video created by Rachel Biel, featuring work by TAFA's nearly 250 textile artist members.